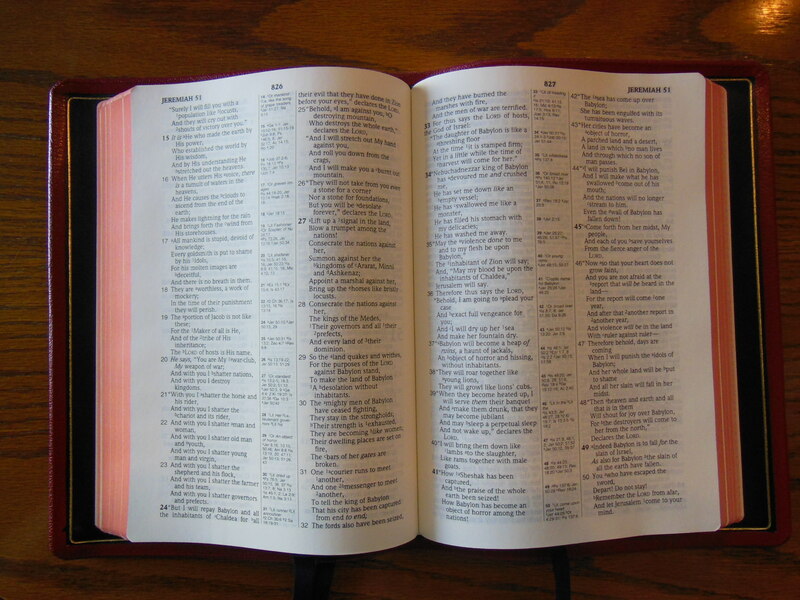 The perfect Bible… For me, that is. 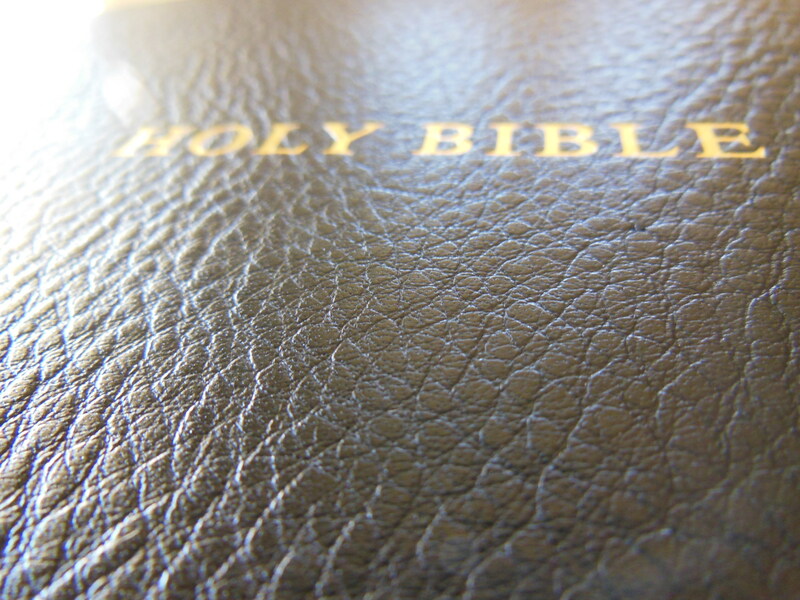 Let’s face it, perfection can be subjective, when it comes to Bibles. Everyone has different deal breakers and necessities, when it comes to features. I know for me, a glued binding is a deal breaker. It is the unpardonable sin amongst Bible publishers. They really need to just stop trying to save a buck and do it right. Of course that is my opinion. 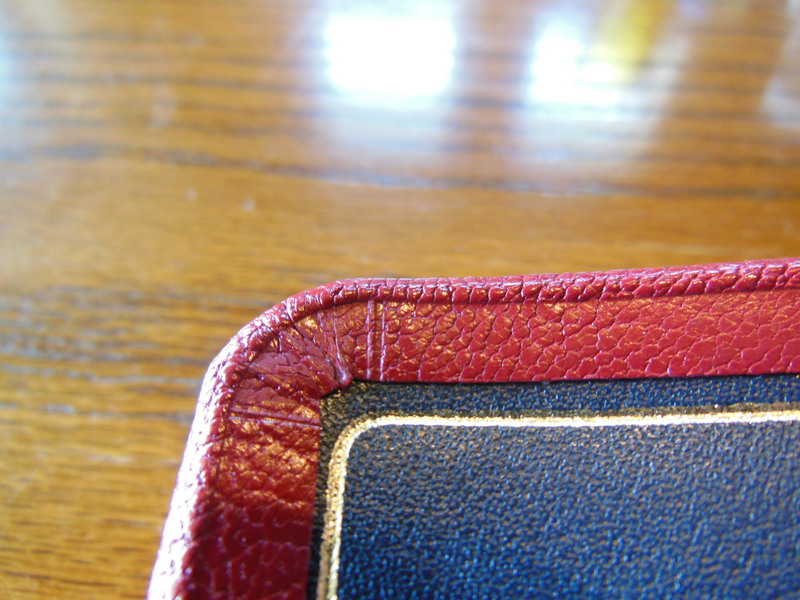 Many people don’t even know the difference between a sewn binding and a glued one. To them other features are more important. They might insist on having a specific study Bible. There are three premier brands today that I know of, Cambridge Press, Schuyler(skyler), and R. L. Allan. 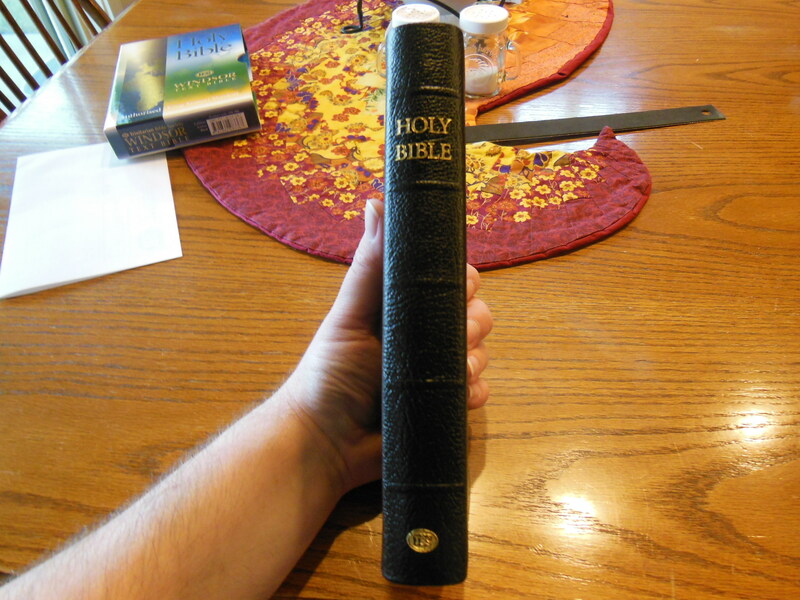 I’ve done reviews of Cambridge Bibles. They have been very generous providing me with review copies. Schuyler does not provide gratis review copies and neither does R. L. Allan. I had to wait for a time when I could afford to purchase one. I had seen a Schuyler. Our Pastor at Church received one for his Ordination. His is an E.S.V. Quentel in green goatskin. Reviewing Bibles exposes you to the differences between materials, features, and manufacturing methods. With the knowledge gained by reviewing so many Bibles, I knew the attributes I wanted. I knew that first of all, it must be as legible as possible. 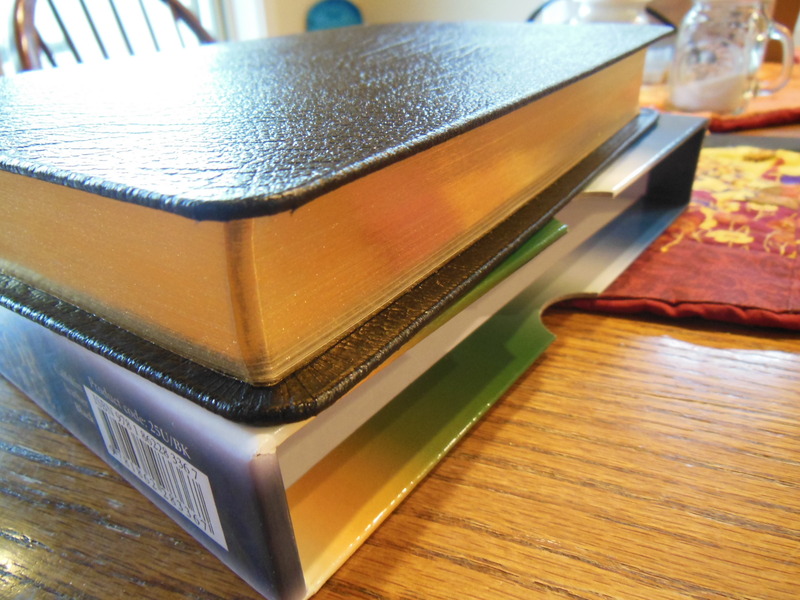 I’ve reviewed several Bibles that either used paper that isn’t opaque enough, old typesets with edges that are not sharp, small font, thin font, poorly inked and inconsistently printed font, and cheap paper that offers little contrast. Second, it had to have a sewn binding. Without a sewn binding it would not be flexible enough to make it easy to read, and it would not be durable enough to last a lifetime. 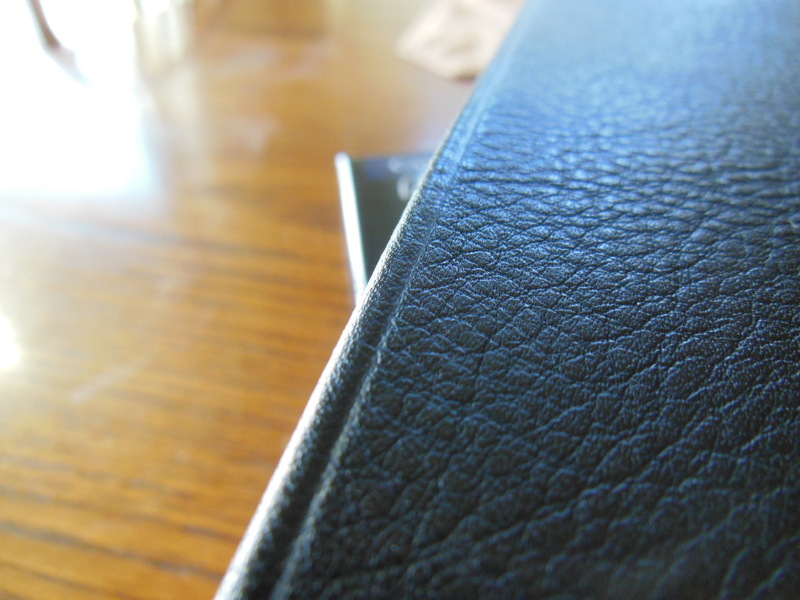 Third, it had to have a high quality, edge lined, goatskin cover. This might not seem like a must, but if you have held one of these Bibles before, you would agree. It is durable, flexible, and the grain is tactilely pleasing. Fourth, it had to be in the New American Standard Bible translation. (NASB) This is by far my favorite translation, to both read and study. If you haven’t read this translation, you should. It is a formal equivalent, and very accurate. This is the translation to read, if you have ever wanted to get as close to the original languages, without learning them yourself. Fifth, I wanted a double column, verse format, with center column references. I know, I know, it is old fashioned of me, and I need to get with the times, but it is so much easier to find a verse, in a verse format Bible. I have the Cambridge Clarion. 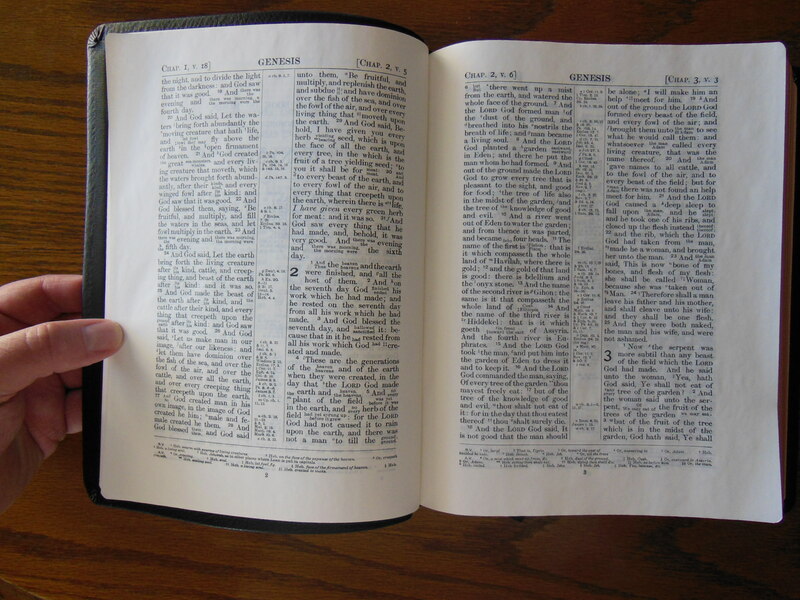 It is a single column, paragraph format Bible, with references on the outside of the page. People informed me that this is the easiest to just sit and read. Well, that might be so, IF your brain, and eyes haven’t been trained to read a double column, verse format, over the years. I tried to teach an old dog a new trick, and it just didn’t work out for me. So this was a necessary feature. Sixth, was size. I wanted a Bible for reading out of in my chair. It couldn’t be too heavy or big. Arm fatigue is a real thing people. Perhaps I’m just getting old, but if you are holding a big Bible in your hands for an hour or so, it gets heavy. Plus they can be downright unwieldy. I despise fighting against a Bible or the cover while trying to read. Finally, it had to have more than one, crumby, cheap, nasty, ribbon marker. I know it seems minor, but I like to follow Ligonier’s TableTalk reading plan. It has readings out of the Old and New Testaments, daily. For that, I need, at least two ribbons. I didn’t want a Bible with the cheap, thin, anemic, looking ribbons, that fold over, and get wrinkled either. I wanted some ribbons of substance that would lay flat and help me turn to the page, without tearing the paper or rubbing the gilt off of the page edges. The only publisher to publish a Bible that met all of my demands is R. L. Allan formerly of Scotland, now located in London. Robert Allan established R. L. Allan’s in 1863. They are still making some of the finest Bibles in the world. In 2013 they moved to London. 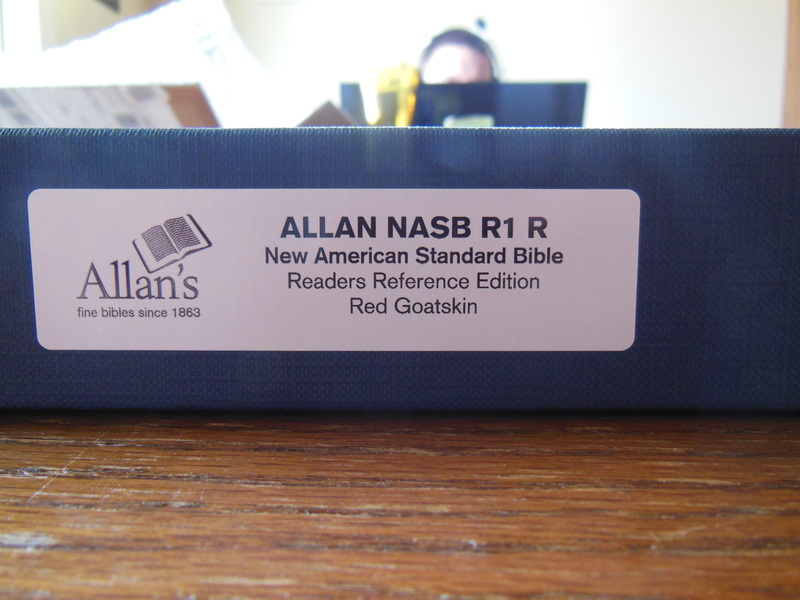 The NASB R1 R uses the Lockman Foundation’s NASB double column, verse format, reference Bible, typeset. The reason I didn’t purchase the Lockman Foundation produced Bible is quality. Lockman is printing and binding their Bibles in China. 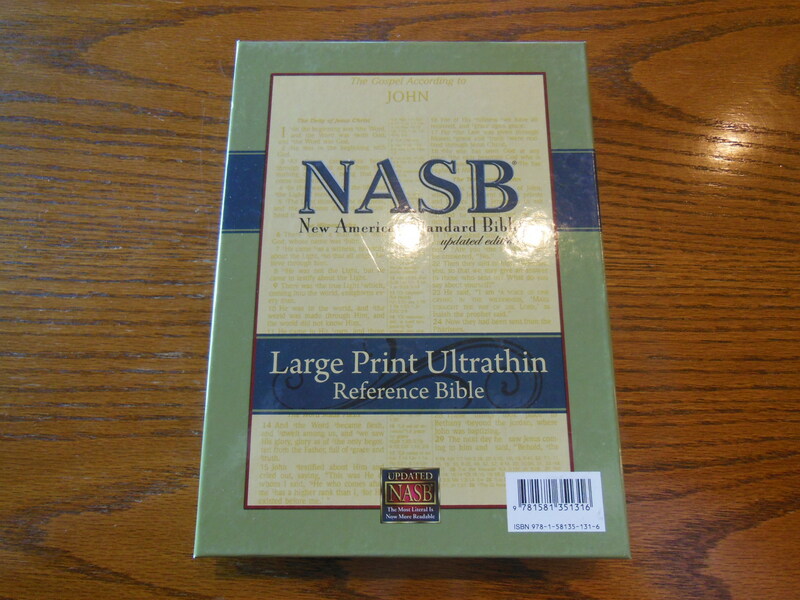 Although they are less expensive to purchase, they did not measure up to the standards that I set for my, “perfect Bible.” R. L. Allan’s NASB R1 R is printed and bound in the Netherlands by Jongbloed. 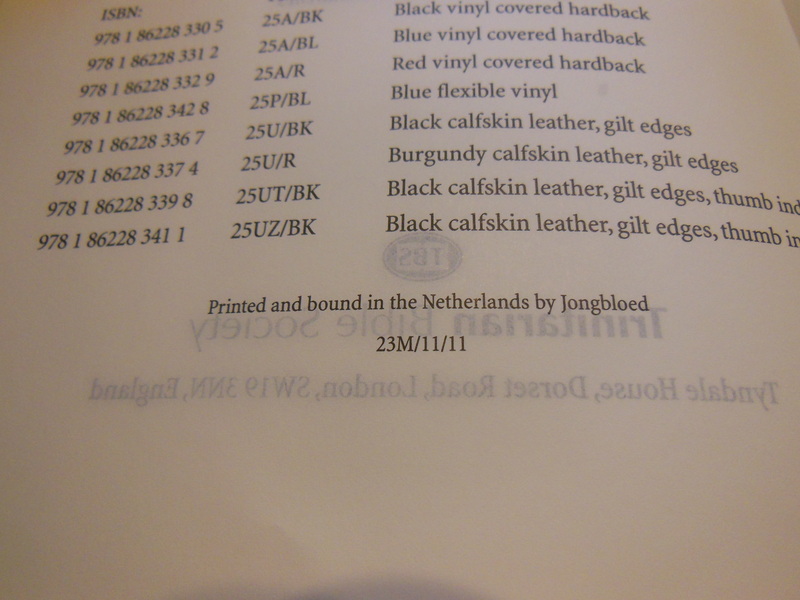 Jongbloed is, in my estimation, the premier Bible printer and bindary in the world. Cambridge Press, and Schuyler, use Jongbloeds as well. It is no coincidence that the three Best Bible publishers use the same printer and bindary. They all use Jongbloeds because of their continued excellence. My choices were limited right off the bat. There are literally no other publishers making the Bible I was after. I could have compromised on a couple of things like, cover material, or case bound instead of edge lined. Providentially, I didn’t have to compromise. It really is a blessing to be able to find a Bible just like I wanted. I feel so very blessed to be living in a country, during a time, like this. The Reformers went through much persecution to get us translations in our native tongues. There are people today, deprived of God’s word by law of their governments. So I don’t take the blessing lightly. I received my order less than two weeks after I placed it. It arrived in a cardboard box. 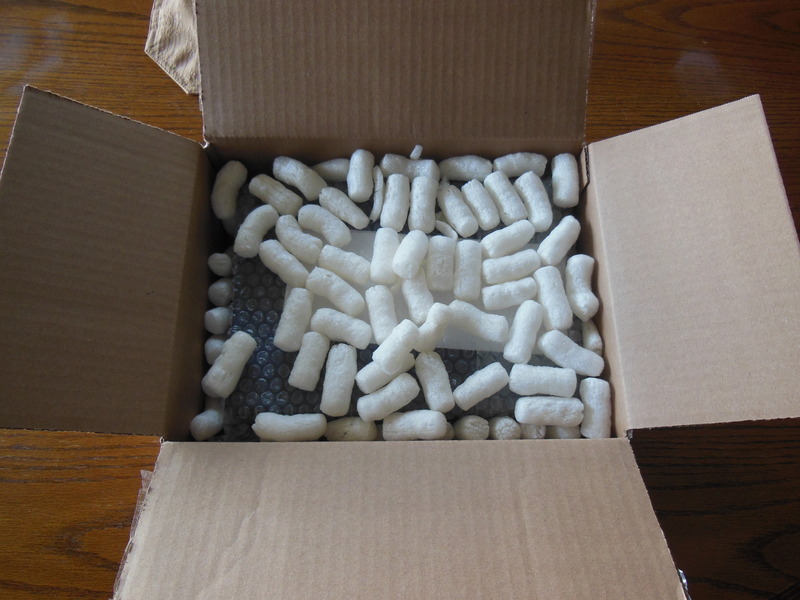 It was cushioned with bubble wrap and little foam puffs. The Bible was in a two piece box. 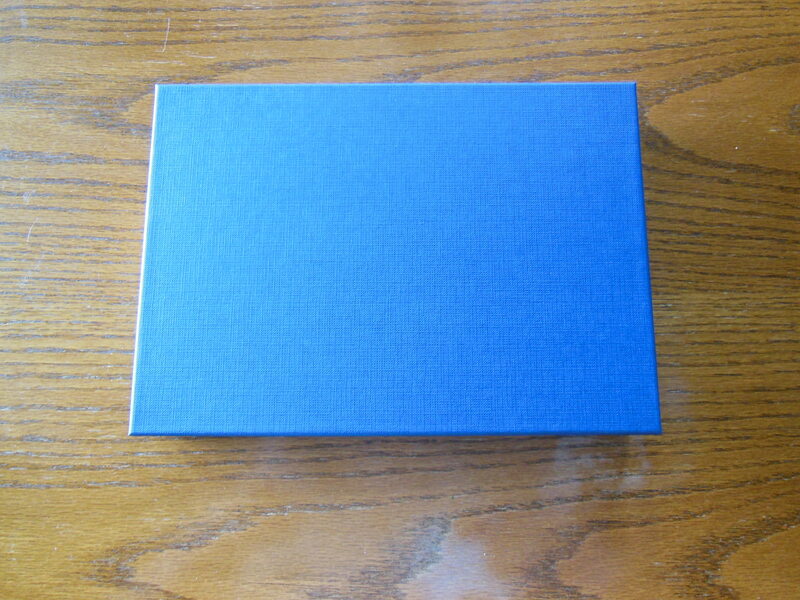 The box is covered with a woven blue material. I am keeping it to put my Bible in when I am not using it. It will sit by my chair safe and sound. It was wrapped in paper inside the box. It arrived undamaged from shipping. 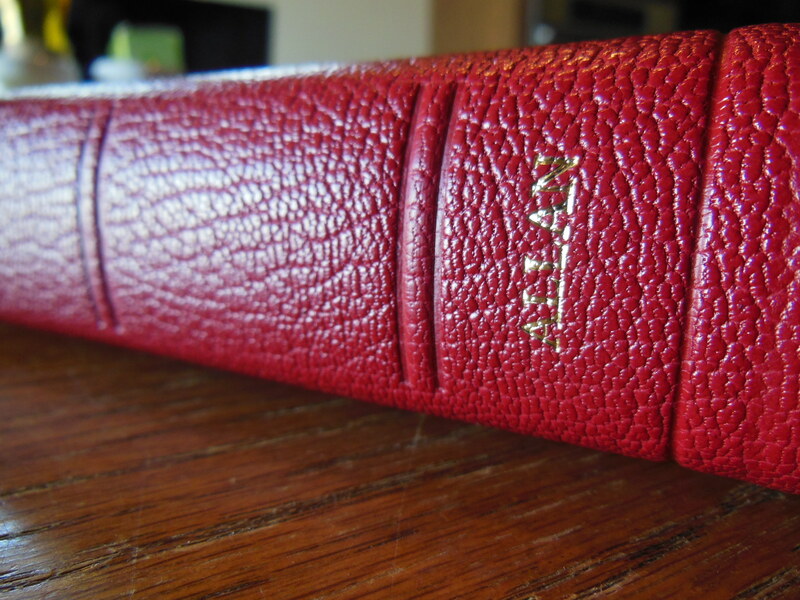 While unwrapping the Bible I was welcomed with the aroma of quality goatskin leather. Some Bibles smell like chemicals and adhesives. The cover is thicker than I expected. It is a rich crimson red. There are two channels around the perimeter of the cover. It has a wide yapp, that is the overhang of the cover. It protects the page edges. 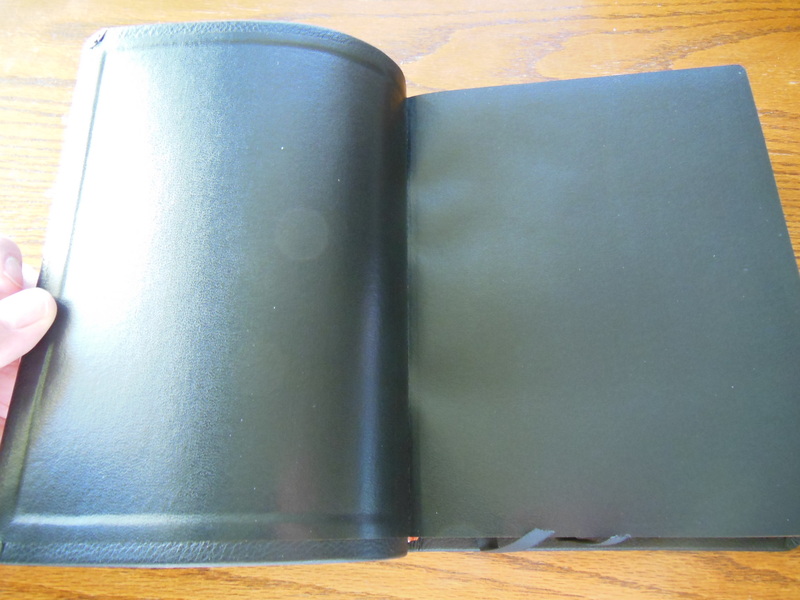 The inside cover is lined with dark blue leather. There is a gilt line around the inside perimeter. The edges of the cover are folded over and glued perfectly. The corners are nice, neat, and tight. 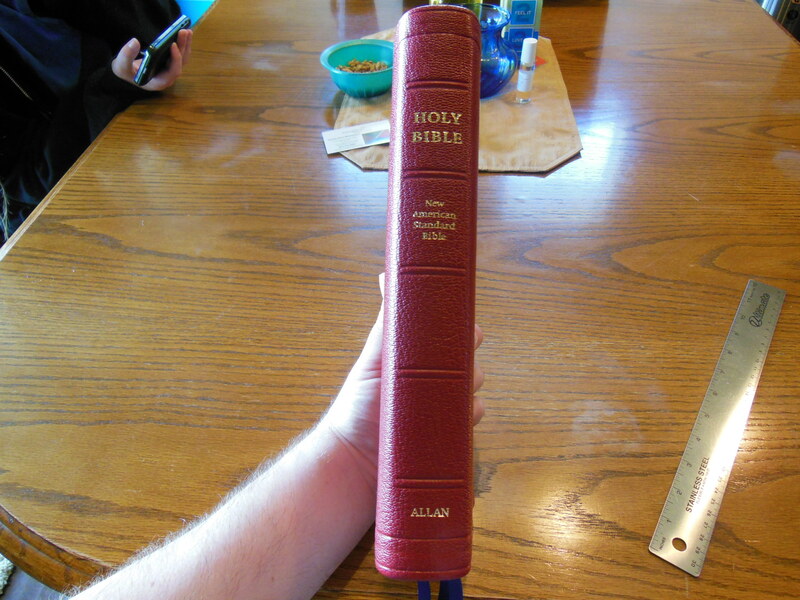 The spine of the Bible is stamped in gold with, “Holy Bible” at the top, “New American Standard Bible” under that, and, “Allan” at the bottom. It has white, head and tail bands, art-gilt page edges, and three lovely, navy blue ribbon markers. In the front you’ll find the presentation page, family records pages for parents, children, marriages, grandchildren, and deaths. These are printed on heavier paper, but not so heavy as to inhibit the opening of the Bible. Then, there is the Title page, Publishers info,Foreward, and a list of the Books of the Bible. 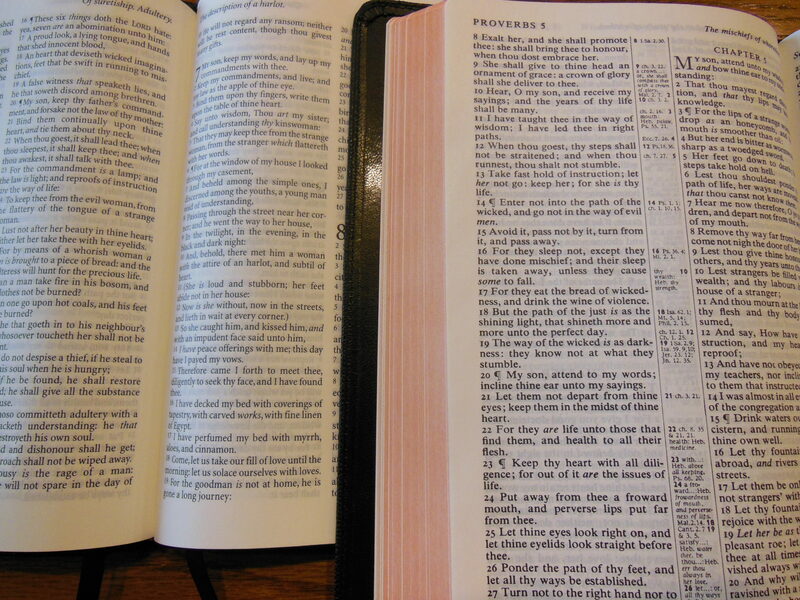 As I mentioned earlier, the Bible is in a double column, verse format, with center column references. The center column is bordered by a single line on either side of it. The chapter numbers are bold and large. There are topic headings throughout. This is a black letter edition. Lockman has over 95,000 cross references in this luxurious publication from R. L. Allan. The font is 10 point in size. It is one of the sharpest and uniformly printed Bibles I’ve seen. The black contrasts against the off-white Bible paper, making it very legible. The paper is beautiful and opaque. The concordance in the back is large enough to be useful, but not so large as to bulk it up. There is 40 pages of lined writing paper in the back for notes. Lockman’s colored maps are retained, but printed on the same type of paper that is used in the front for the records pages, instead of the glossy paper that Lockman uses. There are 8 maps. The glossy paper tends to crack and tear, so I am glad to see that it was not used in this edition. This is a pretty thin Bible. 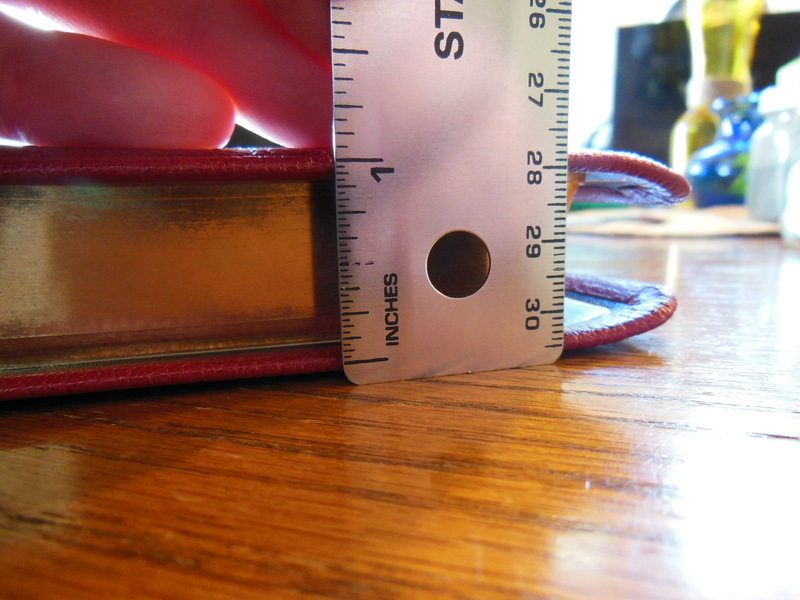 It measures 1″ thick. 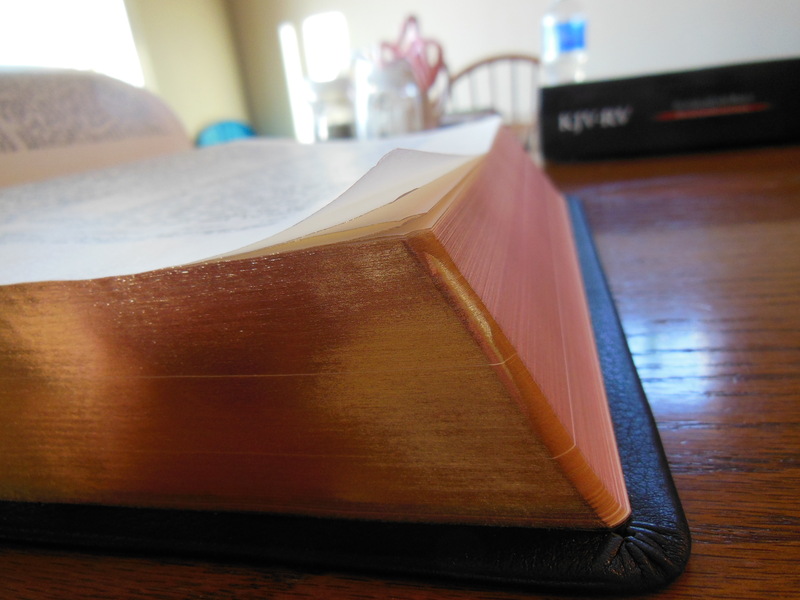 The text block is 9″ tall by 6 1/4″ the Bible when closed measures almost 10″ tall by 7″ across. It is very handy. Just the right size to contain all of my desired attributes, while not growing too large with undesired features. Since this Bible has everything I could want in a Bible it is no surprise that I would think so highly of it. I can’t get over how satisfied I am with it. I am so happy with it that I mailed several of my other Bibles to friends. This one replaces about 5 others I was holding on to for various uses. I have taken some ribbing that was unexpected. It was brought to my attention that this should be called the, “Spiderman Bible” due to the red and blue colors. I thought that was amusing, but come one? If I’m going to associate it with a super hero it would be Superman not Spiderman lol. In all seriousness, this is probably the best Bible I’ve ever owned. That is saying a lot, because I’ve been sent some pretty good Bibles. evangelicalbible.com They are the best online retailer of premium Bibles. 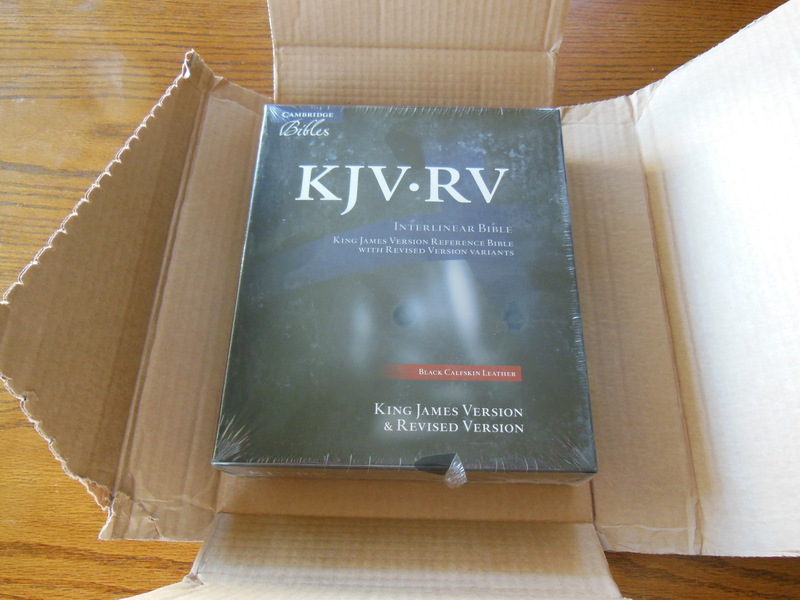 Have you ever wanted to compare the changes in the 2011 NIV against the KJV or NKJV? Hendrickson’s Complete Evangelical Parallel Bible with the KJV, NKJV, NIV, & NLT in black bonded leather gives you that opportunity. I saw this Bible on Hendrickson’s web page. It struck me as an interesting opportunity to look for myself at the changes made in the NIV and compare them to a trusted version like the NKJV. I’ve read a number of books on the topic. My studying was done between the time when the TNIV was introduced and when the 2011 NIV replaced it. I’m not going to say I can tell the future, but I called it when I told my wife that they will just drop the, “T” off of TNIV and try to sneak it by everyone. Well, I was right. That is what happened. 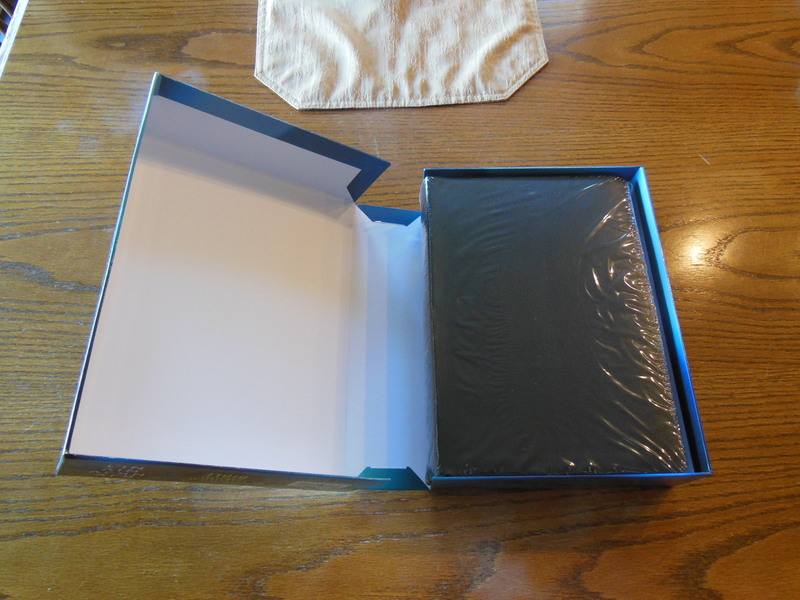 Hendrickson did a decent job of packaging this large Bible. 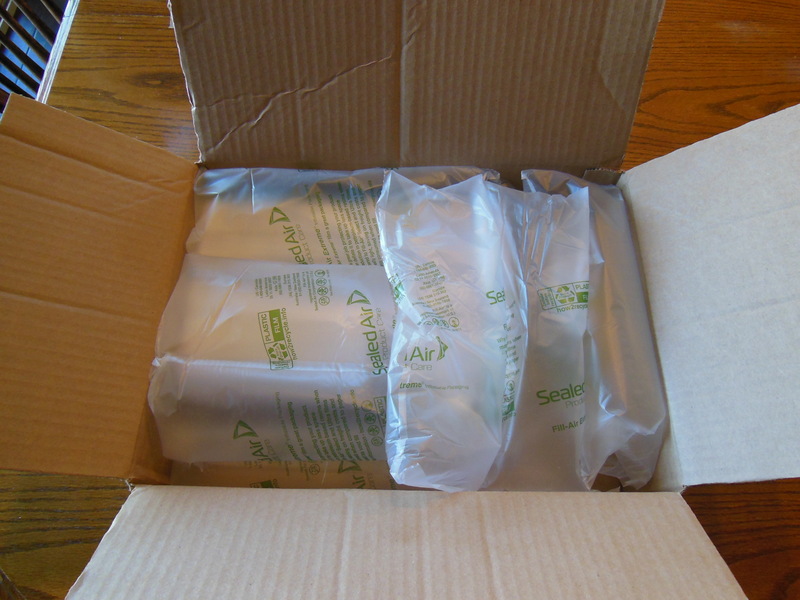 It was shipped in a cardboard box, with airbag type packaging cushions inside. 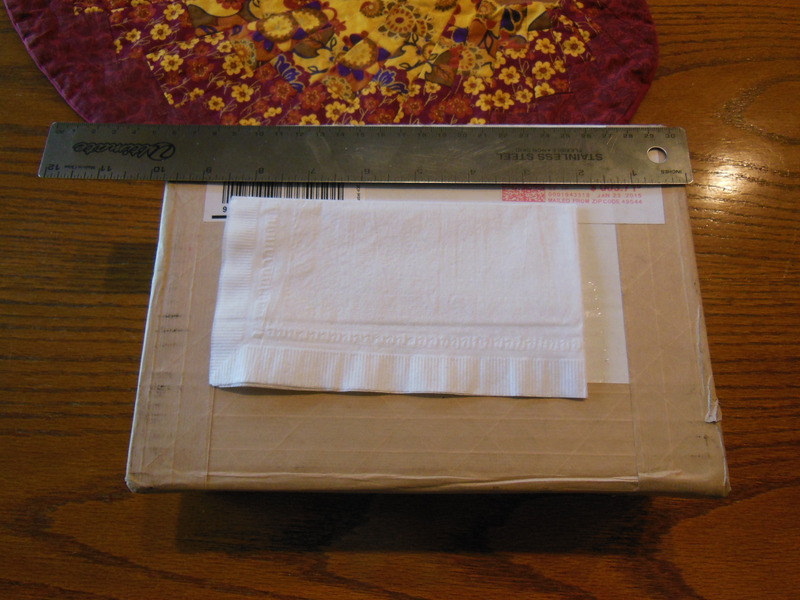 The Parallel was wrapped in plastic, and was in a clamshell retail box, that should be retained for storage. The Parallel has a black, bonded leather cover. Bonded leather is less expensive than genuine leather, which is made from pigskin. Good bonded leather can last a very long time. Bonded leather is kind of like the particle board of leather. It is bits and pieces of leather that are pressed together with adhesives and die to make sheets of bonded leather. It is typically a bit stiffer than calfskin leather and very stiff compared to goatskin leather. 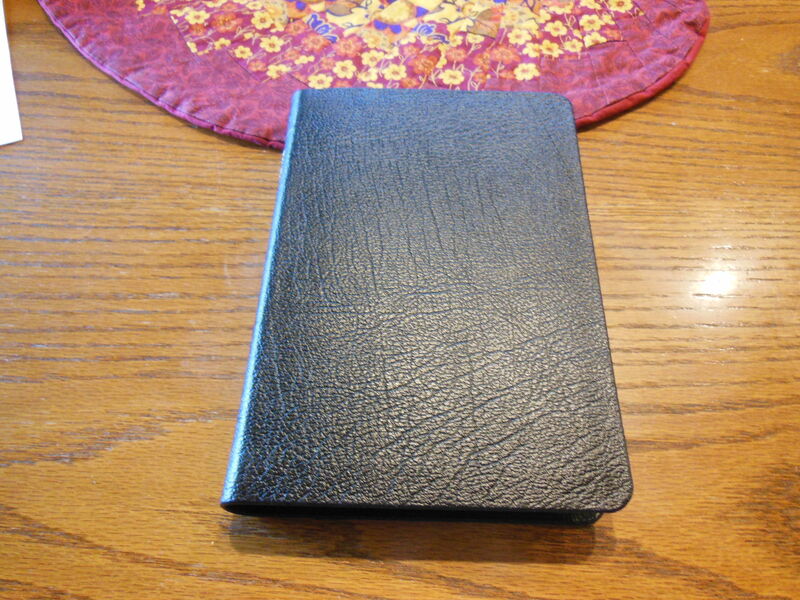 It is the lowest grade of leather cover, but it does fill a niche in Bible cover options. If I were to buy a goatskin hide from a supplier it would cost me about $80.00. I could probably get about three or four Bibles this size case bound. So if the publisher wanted to make any money they would have to pass the costs along to the consumer. Synthetic covers are less expensive. They are also almost as flexible as premium covers. The problem is that they aren’t as tough and don’t last as long. Bonded leather covers, in my opinion are tougher than the synthetic covers. It might not be as flexible as a synthetic cover, but it will add more structure to a big Bible like this than a synthetic one. Your other option is to get a hardback. These are good for giving the Bible structure. They are also pretty durable, but they can get bent, torn, scratched, and waterlogged pretty easy. They are easy to rebind as well. So you see, there are several options, you just have to decide how much you want to spend, what features are must haves, and what you can compromise on. I think as far as parallel Bibles go this one is built pretty well. 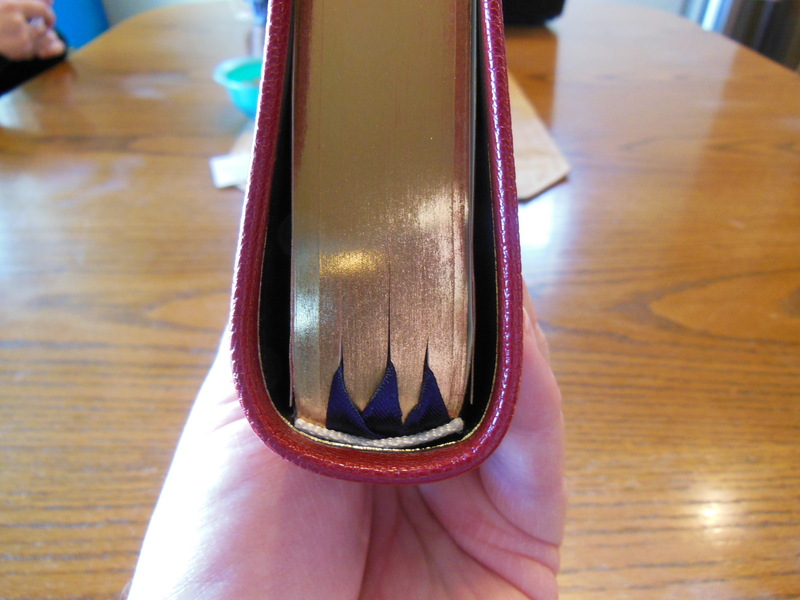 This Bible has a sewn binding. That is almost a necessity on a Bible this size. You actually have four complete Bibles in one volume. 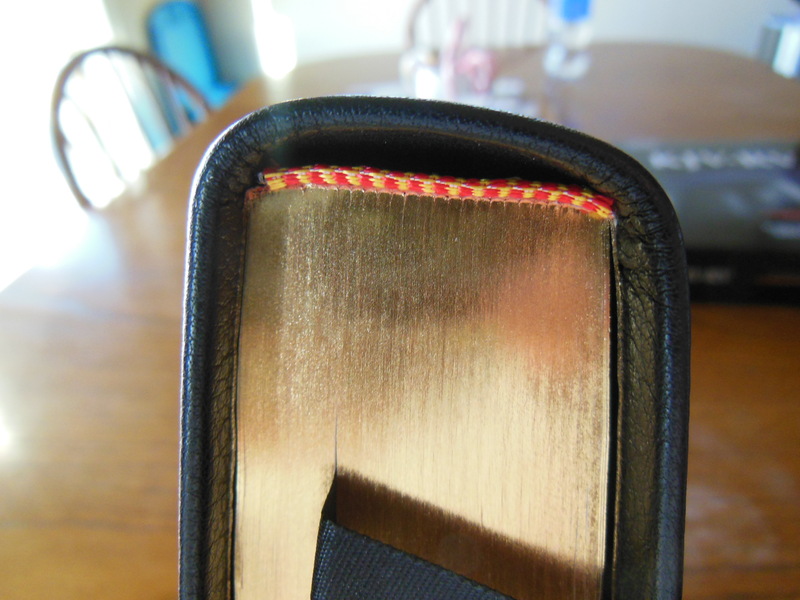 The sewn binding makes this Bible much more flexible than a perfect bind. Perfect bound books have all of the pages stacked up, cut square, and glued together to form the spine. 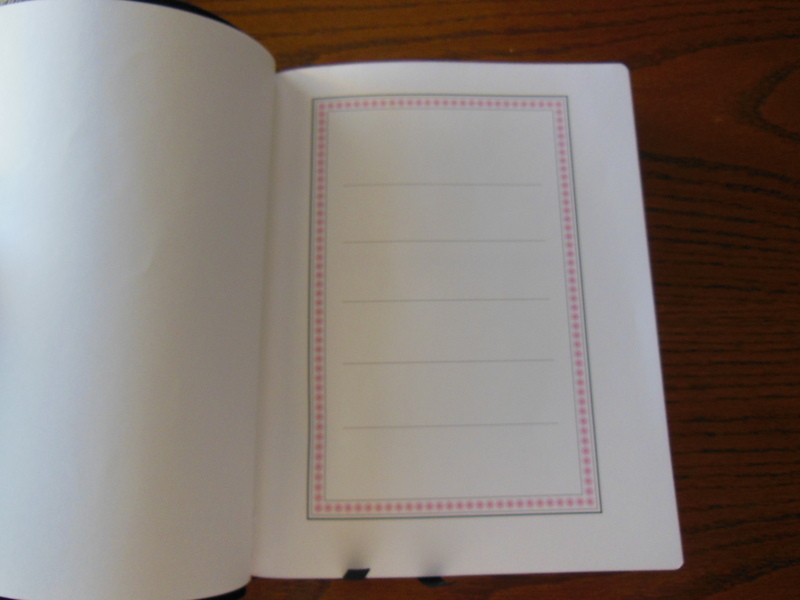 A sewn binding stacks pages into separate pamphlets called signatures. These are stacked up against strips of material called binding tapes. The signatures are sewn to the tapes and to each other. This gives the Bible the ability to open fully, last longer, not lose pages, and hold together even if the glue gives way. 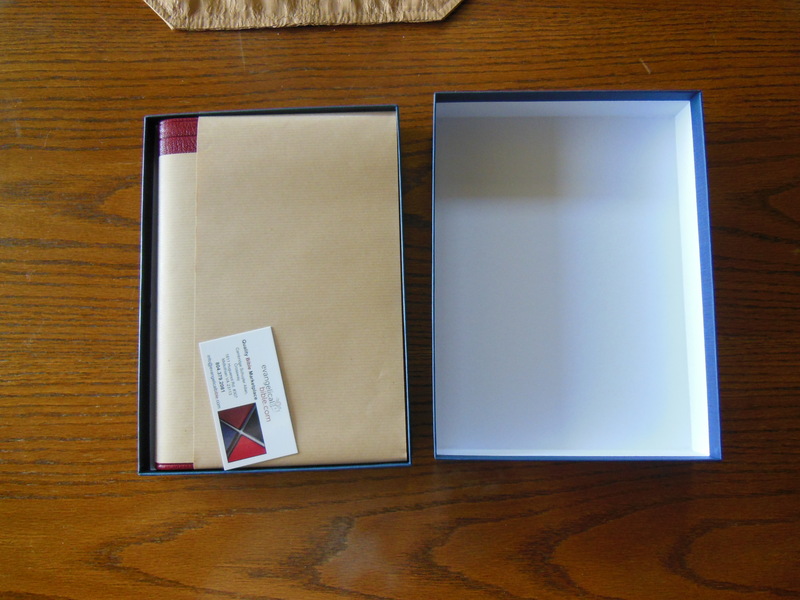 It is case bound, which means it is glued into the cover by the end papers. An edge lined binding glues the inside cover tab to the end papers of the text block and then covers the tab with another piece of paper, vinyl, or hide/fabric. You see edge lined bindings on premium Bibles. Premium Bibles usually are $150 and up. Case binding is the most common kind you’ll see. On top of having a sewn binding, four Bibles, ribbon marker, and a bonded leather cover, this Bible has pretty decent paper and print for a giant like this. I was expecting to have some difficulty with legibility due to how much they had to put in this volume, but this one uses clean sharply printed modern digital typeset. It was printed in China. The font is 8 point in size. That doesn’t sound like much. Don’t let that fool you. It is very legible. I was pleasantly surprised. The paper is pretty good too. It offers good contrast with the font without being too white. The spine is square, not rounded. There are decorative head and tail bands, a ribbon marker, publisher’s notes, limited foot notes, and gold colored gilt page edges. I don’t want to sound like a, “negative Nelly” and wait for it… wait for it… BUT I didn’t expect to dislike the NLT so much. I’ve always heard that it was, “dumbed down.” I never expected it to be as gender neutral as the NIV. Now, don’t get the wrong idea, I am not anti-NIV or NLT per say. I am just a big fan of formal equivalent translations. Dynamic equivalents have their place. There are many new Christians who have trouble and need the extra help. My first Bible I was given was a parallel KJV/NIV. There are people who have trouble with English and need a little help. When you get down the road a little bit, you really need to get an NASB or ESV in my opinion. If you feel that you need a little help, I would suggest an HCSB over either the NIV or the NLT. 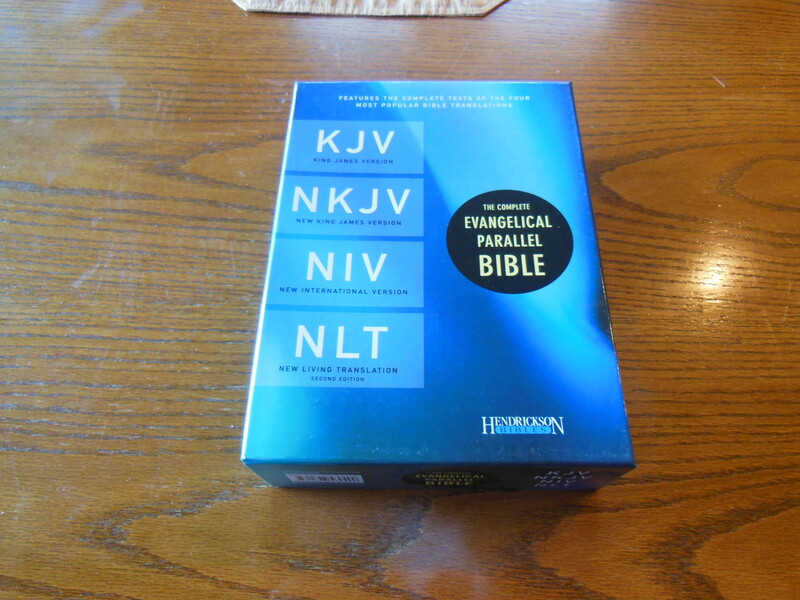 Overall a person buys a parallel Bible for the purpose of comparing translations. In that regard alone this Bible handily accomplishes that end. For those of you who aren’t familiar with Lockman Foundation, they are responsible for the New American Standard Bible translation. 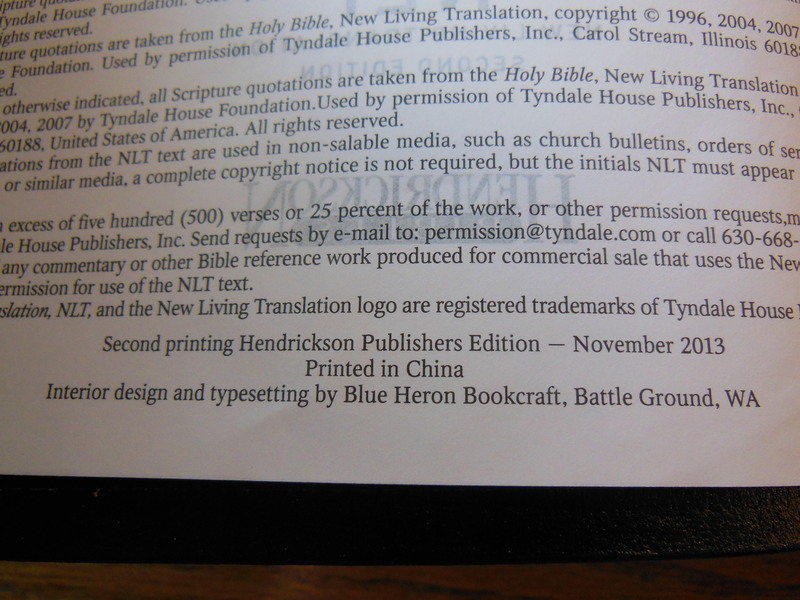 (NASB) They keep the copyright so it doesn’t get changed. They are not in it for the money. They are a non-profit corporation. The money goes back into making Bibles. The text block is smyth-sewn. This means that instead of what is called a, “perfect binding” which is, stacking the papers together, cutting the ends, and then gluing them together at the spine. They stack up pamphlets called signatures. These are stacked up and sewn to signature tapes. Then, they are sewn to each other as well. The spine is sometimes glued to reinforce it. 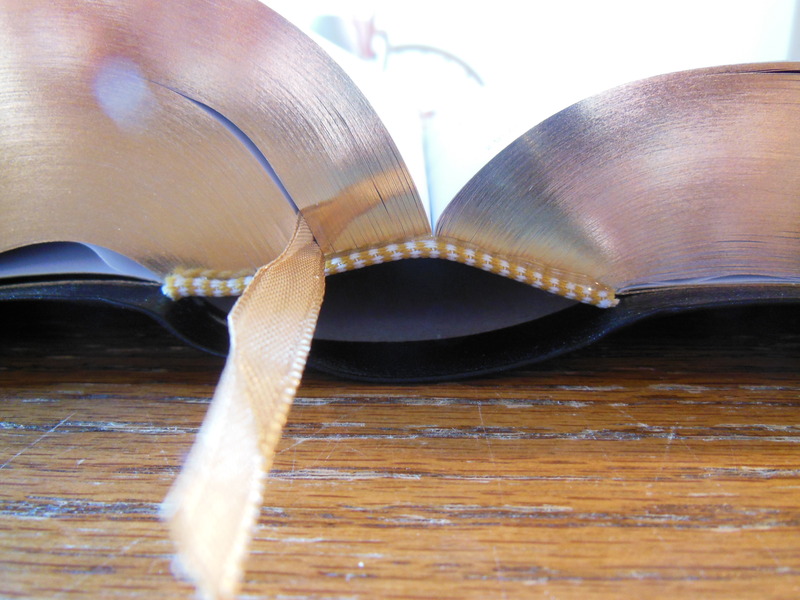 A smyth-sewn binding holds together much longer because the pages are sewn together, and sewn to cords or tapes in the spine. 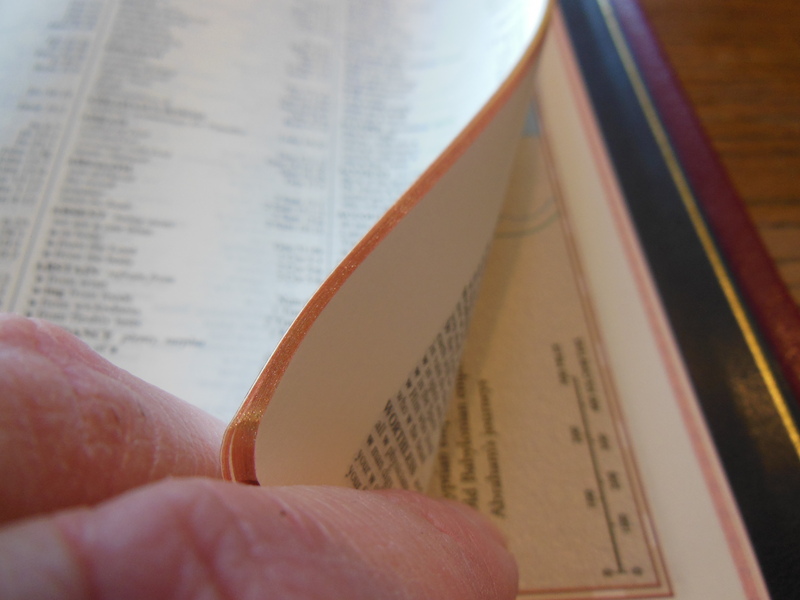 Glued bindings often lose pages from the front and back of the book, as the glue loses its flexibility, and hardens. 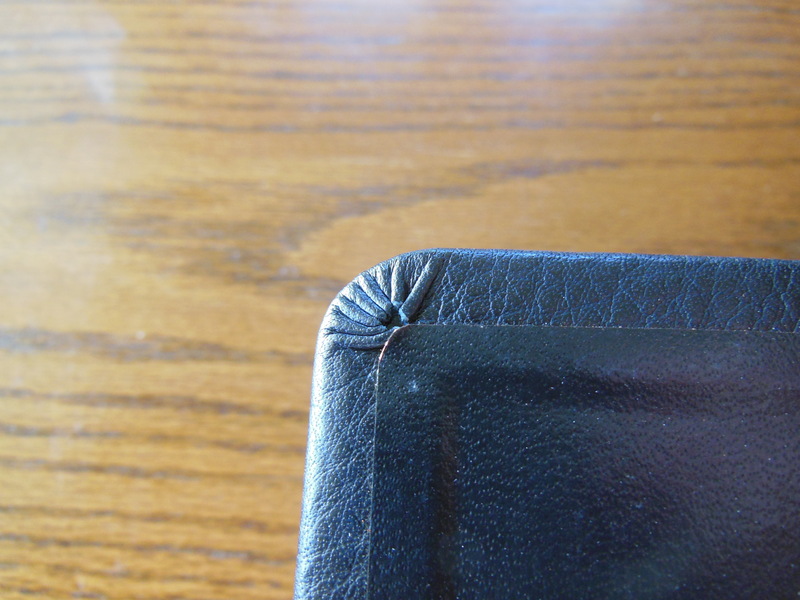 A sewn binding opens better, and it stays open, once it is opened. 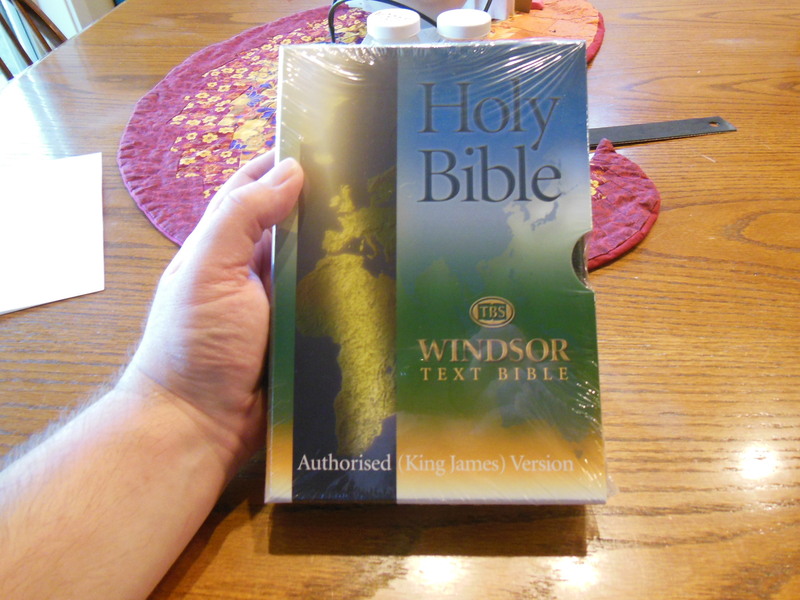 This Bible was shipped to me gratis for review. 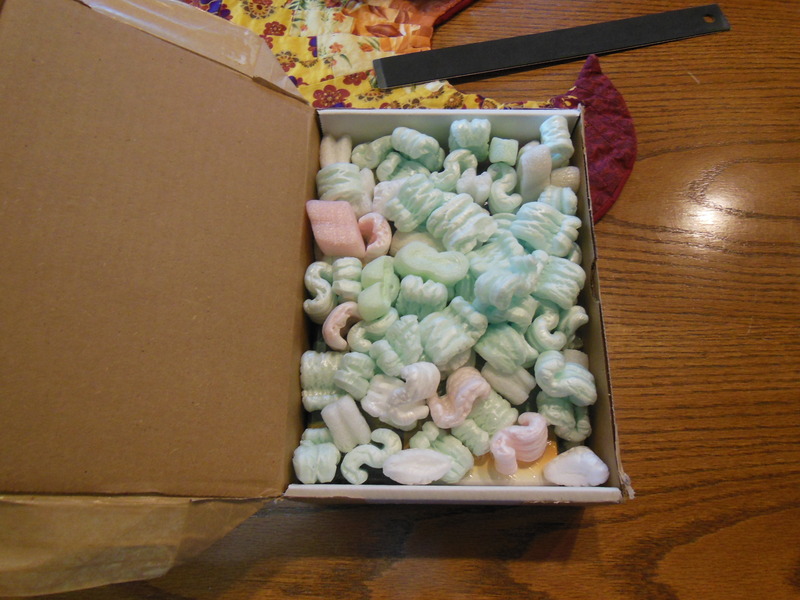 It arrived packaged in a cardboard box with paper packing. It was not damaged during shipping. It comes in a two piece retail box that should be retained for storage. This Bible looks like it will be heavy, but it isn’t. It is pleasant to hold and read. It isn’t too heavy or big, even though you get a nice size font. 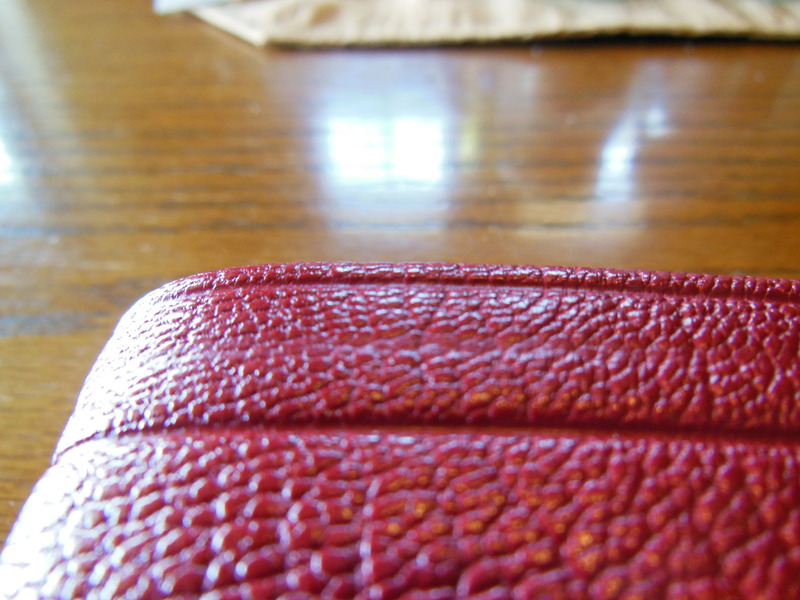 The cover is genuine leather, not to be confused with more expensive cowhide/calfskin, or less expensive bonded leather. 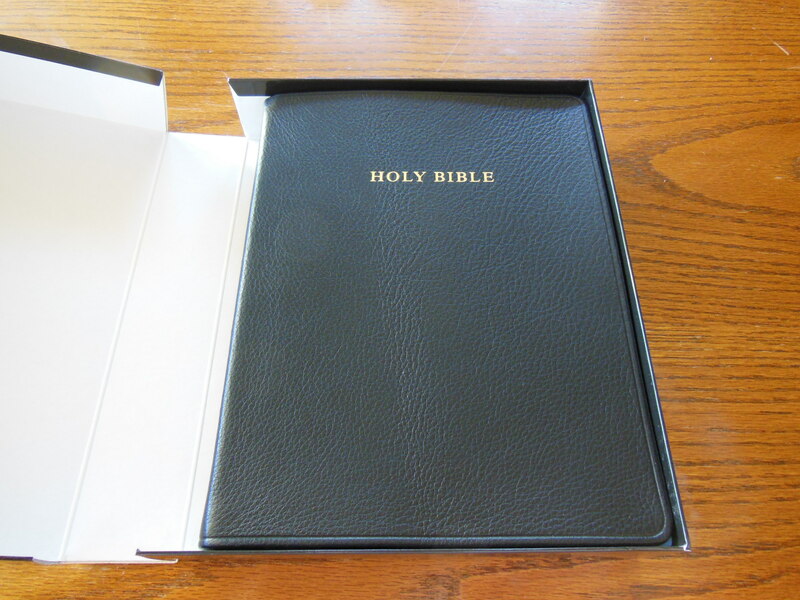 Genuine leather is a good durable choice in Bible covers. This Bible is case bound. The corners are cut and glued well. The vinyl liner matches the cover in color. 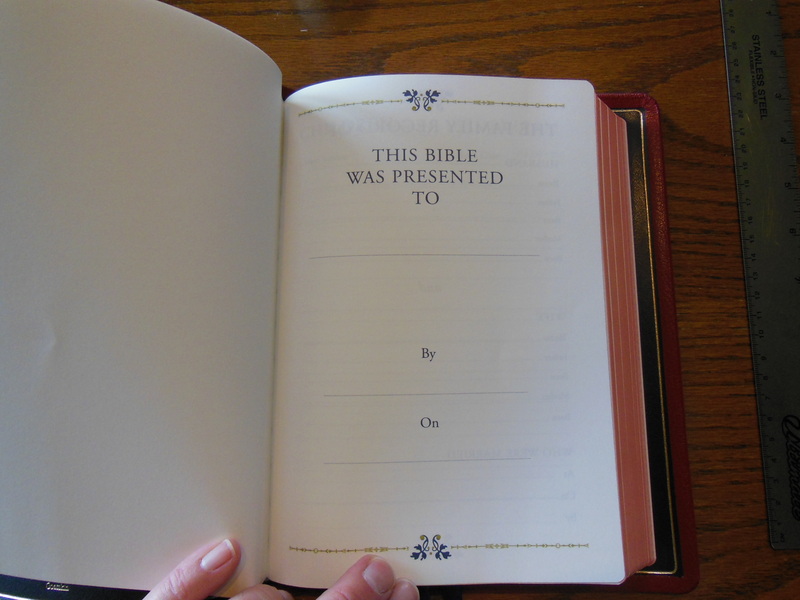 The front of the Bible has a presentation page as well as family records pages. These are printed on a glossy paper. Sometimes ink will smudge so make sure if you write in pen on these that you allow the ink to dry before you close it. Maybe pat them with a tissue as well. Then, there is a section about the translation. It is pretty informative. You should read it at least once if you never have. 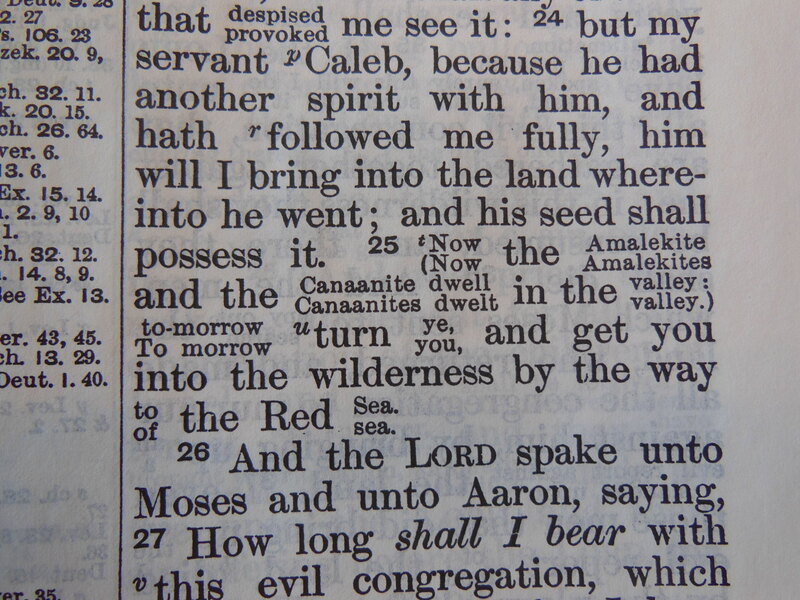 The text of this Bible is as I mentioned before, a double column, verse format, with center column references. The NASB has over 95,000 cross references. This makes it an extremely useful reference Bible. This is a black text edition. That means all of the words are printed in black text. Some Bibles are red letter editions. Those have the words of Jesus printed in red. Well, since the entire word of God is God’s word, we should have it all printed in red, or we could just print it all in black. The paper is decent quality. For the price of this Bible you really do get a lot. There is a pretty good sized concordance at the end. In the back are eight, colored maps printed on the same glossy paper as the presentation and family records pages. I would recommend this Bible for anyone looking for a good reference Bible that will get used. It will provide you with a good translation and a utilitarian functionality. Since it isn’t a premium Bible, and it is pretty tough, you don’t have to be afraid of hurting it. You can purchase them here. The Cambridge KJV/RV Interlinear Bible, in Black Calfskin Leather, A Bible you might not have known that you needed. A little later in 1901 American theologians made a few more revisions to come up with the American Standard Version. This translation of course is where we get my favorite translation the New American Standard Bible. For all of the NASB fans out there, be glad this work was done. When you have an interlinear Bible usually the texts are run linearly parallel with one as the superscript and the other in subscript. 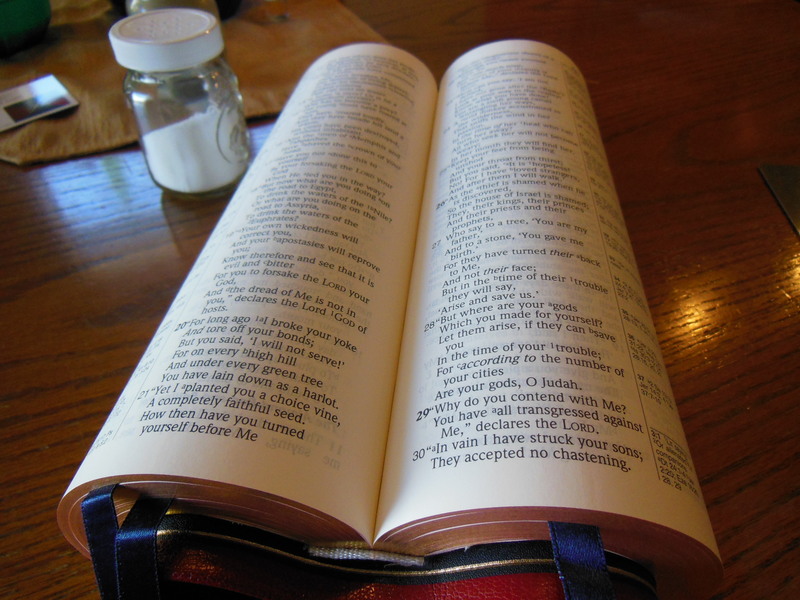 When you have a parallel Bible usually there will be at least two columns of text, where one column is a translation and the other in the column running parallel to it side by side. This gives the reader an easy way to compare the two translations. This Bible however, is unique to my knowledge. Where the two translations are the same you will see only one line of text. Where they are different from one another the text will be more like an interlinear. 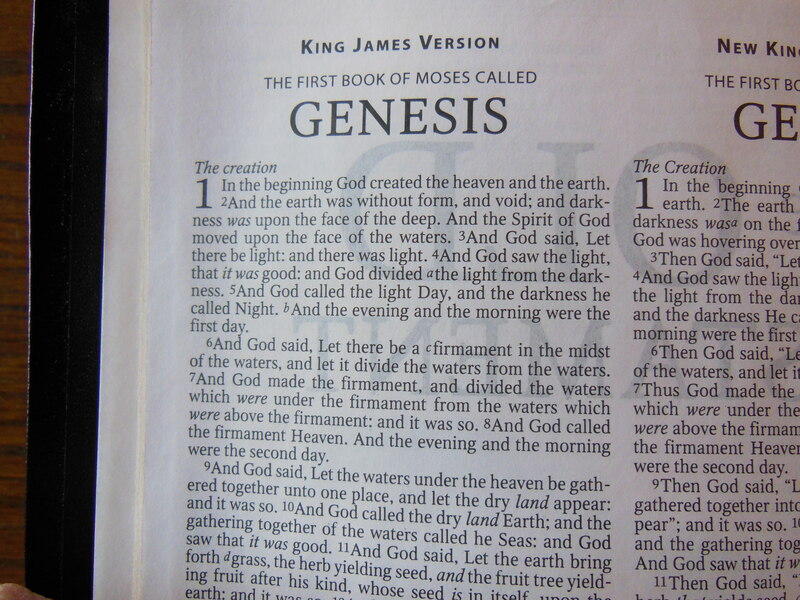 The Revised version text when different from the KJV will be written in superscript and the KJV will be in subscript. It looks like this. When there are a lot of differences, in a short space, it can get a little confusing, or distracting to read. This doesn’t happen very often. I find that this method, with these two specific translations, works quite well. When I come to a difficult section in the text, I have the RV to look at. It does help. Another attribute of this type of interlinear is that it avoids the bulk usually associated with parallel Bibles and other interlinear Bibles. Most interlinear Bibles have both texts in their entirety. This one only becomes interlinear when the text is divergent. This cuts down on the space needed. 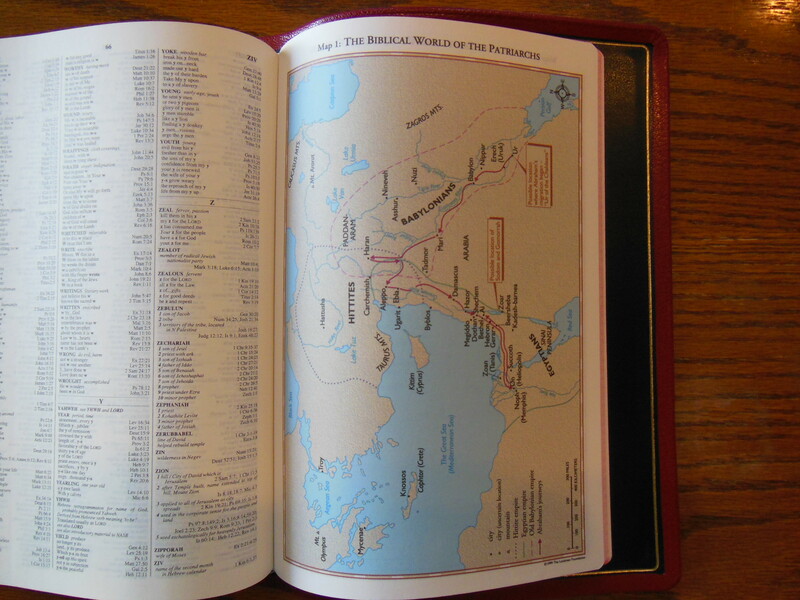 It is a nice addition to any Bible collection, and for modern application, it makes the KJV more accessible, without losing the old world style of the KJV. Granted, there are more modern translations, and there are modern parallels, but they do make you aware that you are reading a modern translation. 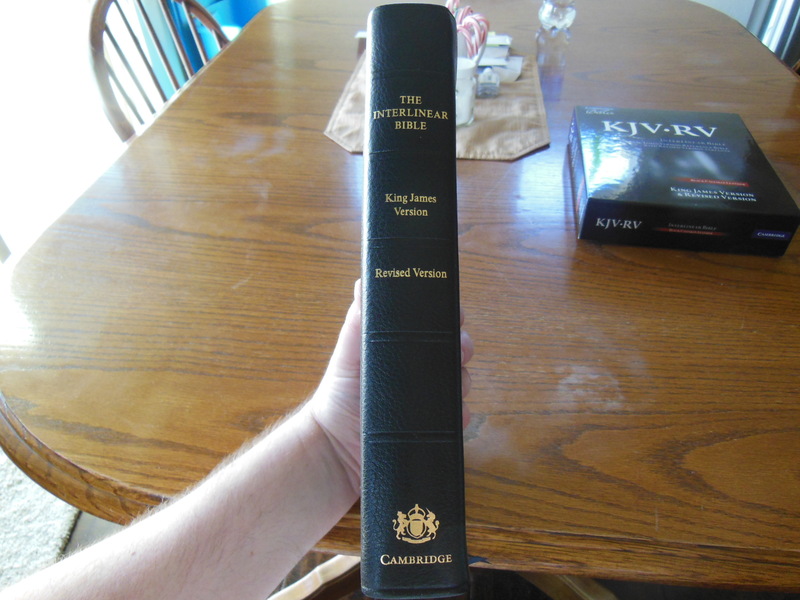 So if you love the KJV, but sometimes have difficulties with it, and you love the way the English language sounded then, this is a Bible you should own. Aesthetically, this is a very nice Bible to look at. Cambridge has a good reputation for producing high quality Bibles that will last longer than you will. 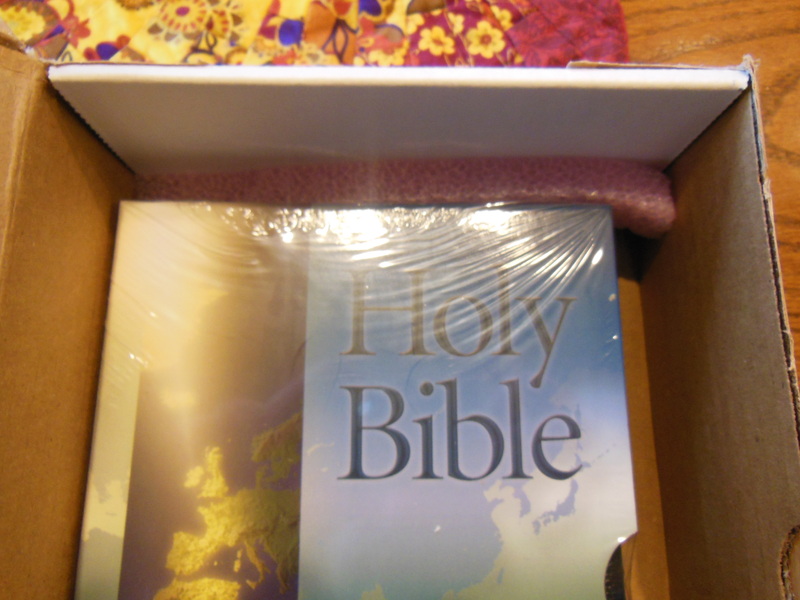 This Bible came packaged in a cardboard box. It arrived at my house undamaged and in good condition. 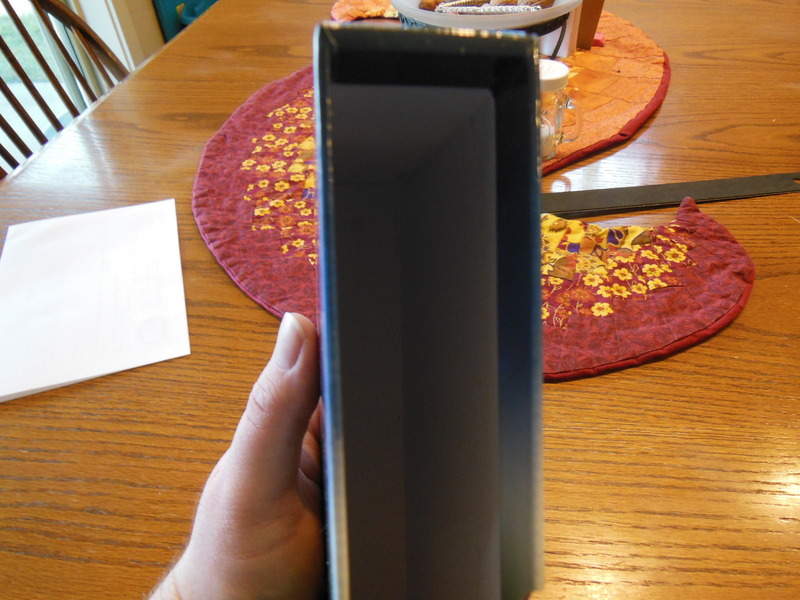 It was inside of a clamshell designed retail box that should be retained for storage. The KJV/RV Interlinear is not a small Bible. It is about the size of my NASB, MacArthur Study Bible. 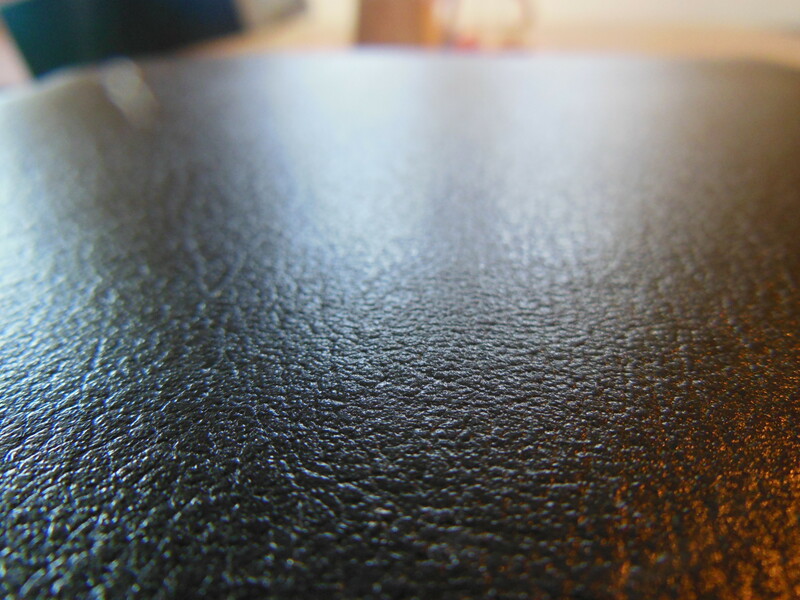 The Cambridge is covered in very nice black calfskin. The cover is obviously, leather. There is no shiny, artificial look to it. It doesn’t feel hard, and slick, like the cheaper, pig skin leather covers on lesser Bibles. The leather smell also reinforces in your mind that this is not a synthetic cover or overly processed leather. The binding is smyth-sewn. The Bible is case bound. The inner cover is lined with a black vinyl adhered to it. The corners are nicely cut and glued. The cover is stamped with, “Holy Bible” in gold. The spine also is stamped in gold with, “The Interlinear Bible” at the top, “King James Version” under it, and “Revised Version” under that. On the bottom is the Cambridge logo with the word, “Cambridge” under it. The page edges are art-gilt. 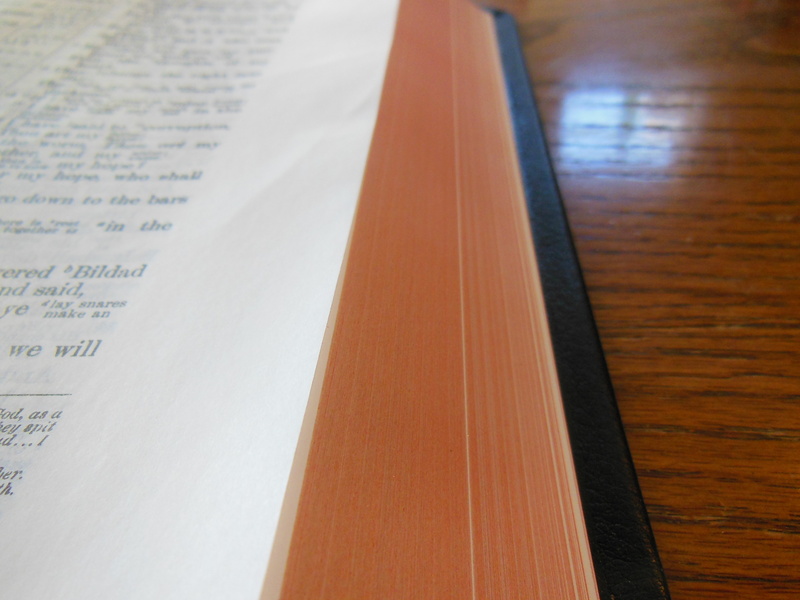 The red under gold gives the page edges a warm look, when the Bible is open. 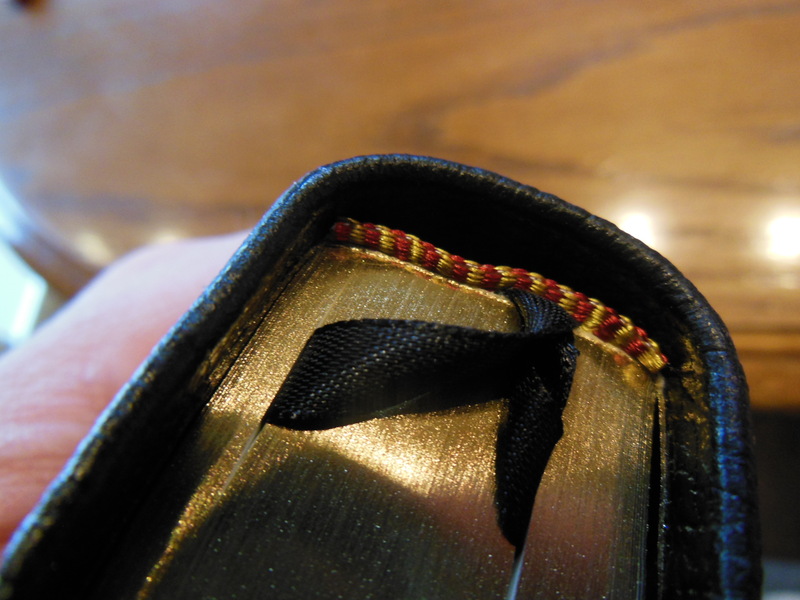 There are decorative red and gold, head and tail bands. 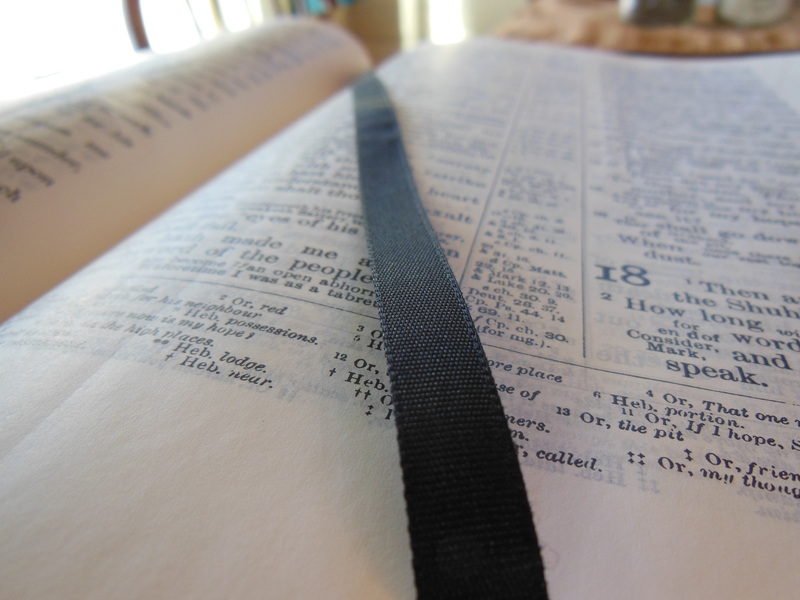 The two black ribbon markers are higher quality than you would find in cheap, mass produced Bibles. 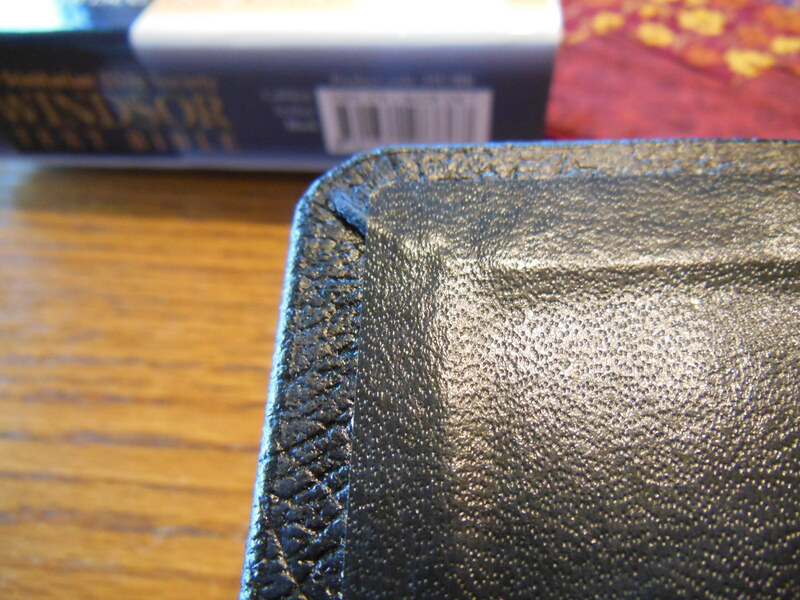 I know some people complain about page corners curling with some Cambridge Bibles like the Clarion. When I first opened this Bible, the paper did seem a bit wrinkled and the page corners curled just a bit. After being out of the box and giving this Bible a while to come to a state of homeostasis with the dry Idaho air, the page edges flattened out and the wrinkles went away. I do wish I had waited a while to take the pictures. The paper is behaving much better now that the Bible has been opened for a while. I personally, like the page corners to curl up just a bit. 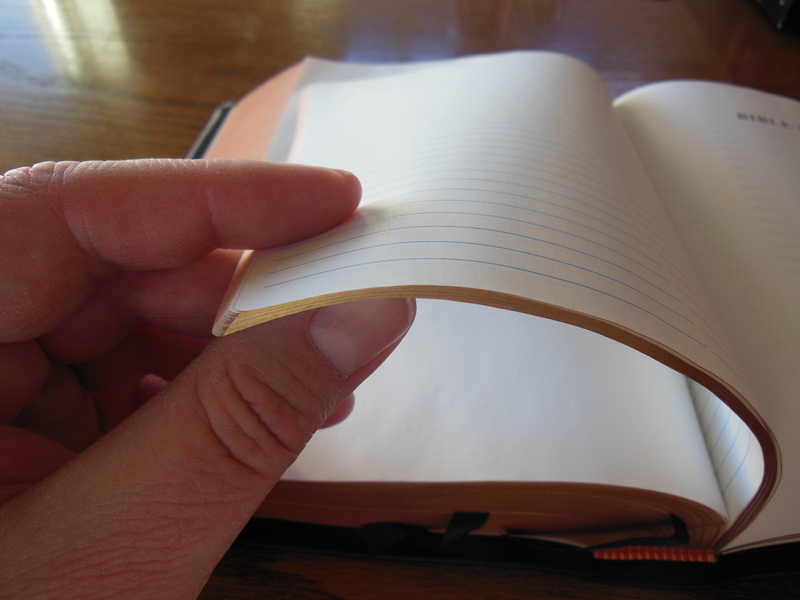 Have you ever tried to get the pages apart to turn them, on a Bible with very thin paper, only to be frustrated page after page? There you have it; I made a negative quality into a positive feature. Now don’t get me wrong, I hate it when the entire page edge curls up, and interferes with my reading, but let’s not get too crazy with our demands. After all, the paper on this Bible is very nice. 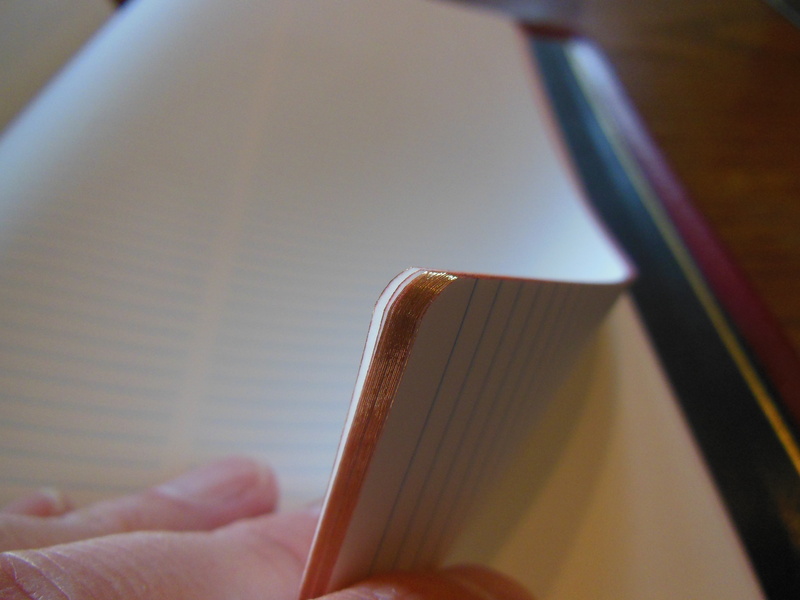 It has wide margins and is thick enough to take notes on. 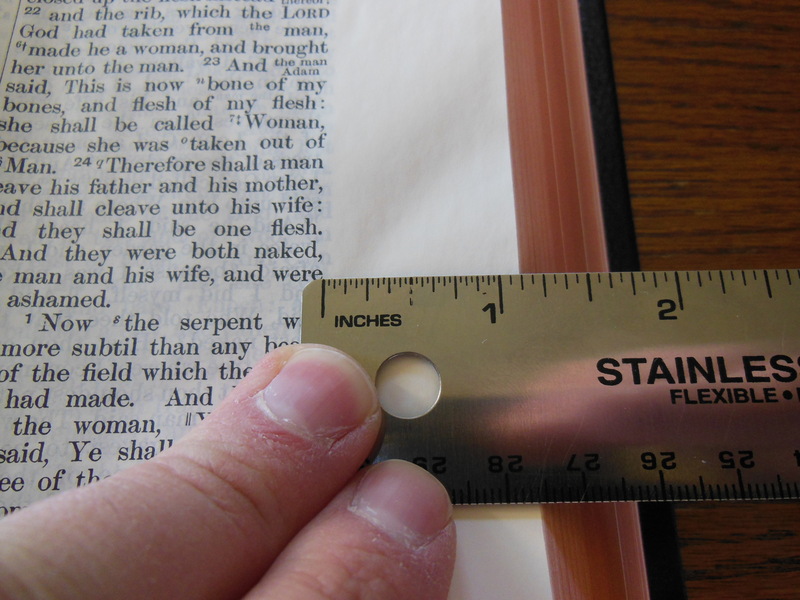 The margins are about an inch. It is also a pleasant off white color that contrast well against the dark, 10/11 point Millers 2n Small Pica No.4 (small body) typeface. It does look like an older typeset, but unlike some of the very old ones it has held up pretty good. It is also a larger size which helps. Again, thanks to the way this interlinear is set up. This is a black text edition. In the front of the Interlinear you’ll find a presentation page. After that, the publication information including that the Interlinear is printed in the Netherlands. I verified with Cambridge that Jonglboeds did the printing and binding. They are the premier bindery for Bibles. You can’t buy better that I know of. Then there is some information about the Interlinear and translation information about the KJV and RV. The Old and New Testaments are both introduced with a Preface. Usually the older type settings of the KJV are verse format. This was one of the first editions to use paragraph format. It does so in a double column layout with center column cross references. Notes are at the bottom of the page. At the end of the Interlinear there is a section called the, “Bible Companion” which is basically a Bible reading plan. 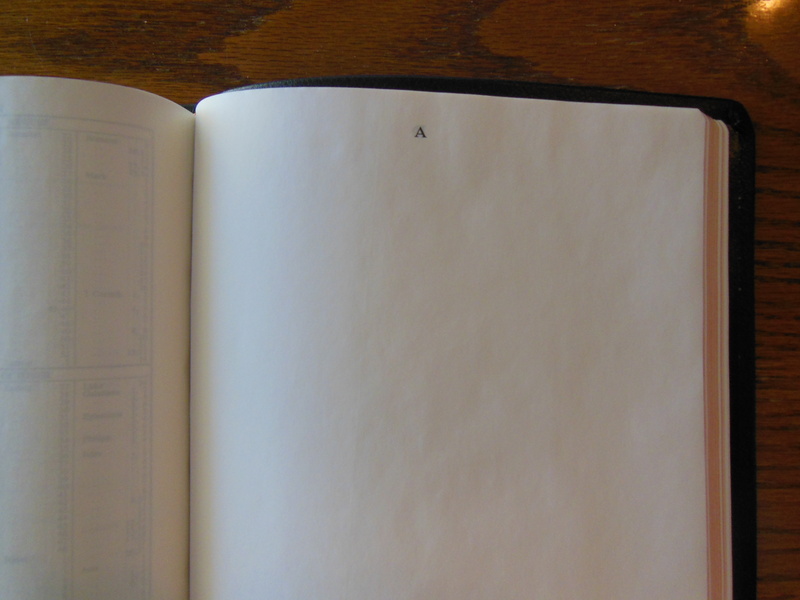 Also there is an alphabetically arranged blank index. This is great for adding your own notes and references. After that we have fifteen color maps, a map index, and a large list of variant readings preferred by the American Standard Version translation committee. All of this together makes for one highly usable, functional, and handsome Bible. If you like the majesty of Early Modern English, but need a bit of help from time to time, or if you just like the KJV and the RV because of their rich history, the KJV/RV Interlinear Bible from Cambridge is an excellent addition to any Christians library, even if it is the only book in it. Be sure to check out the picture gallery at the bottom. via Historic Church Documents at Reformed.org. We all die when it is God’s will for us to die. No contrivance of wisdom or artifice of intellect will stay His hand. I saw this sentiment on fb last night. It got me thinking. How many of us predicate our love for others based on what they believe? I find myself only wanting to associate with people who believe the same as I do. It is easier. There are less arguments and troubles. I guess that is why God is clear in His word that we should as believers only marry other believers. Inside Christianity there are divergent beliefs, that aren’t necessarily unorthodox. We disagree about eschatology, freewill, complimentarianism vs. egalitarianism and so on. If you find yourself not loving a person because they don’t agree with you down the line, I would say that you have a big problem. You do only love your beliefs and not the people God has brought into your life. If beliefs don’t matter in regards to how you love someone, then your love begins to look more like the converting love of God. God loves the unregenerate sinner whom He has sovereignly elected, not on the basis of what they believe about Him, but according to His will. He changes their beliefs out of His love for them. He makes them able to believe in Him. When we love our children, we need to realize that they are not little clones of us. They will develop their own beliefs and ideas. We can’t stop loving them when they stop agreeing with us. Most parents will understand this and agree. Others will not. Our spouses one day might express a sentiment that catches us off guard. We might even wonder if they are the same person we have been married to for all of those years. Don’t let that stop you from loving them. 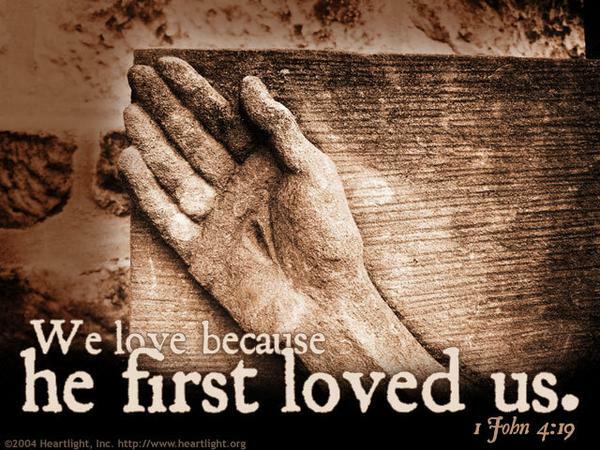 Your love is not for their beliefs, it is supposed to be from the excess of God’s love, that you love others. Love them not on their merit, but because God has commanded it and it is who you are now. Love as fully, selflessly, and cheerfully as you possibly can. Of course beliefs matter. They matter in many different ways. If we believe incorrectly about who Jesus was then we are not saved. I’m not saying beliefs don’t matter. I am saying they shouldn’t be why you love your kids, spouse, or others. Love doesn’t mean giving up your beliefs. Love doesn’t mean you have to agree with them. Love will compel you to share your heart for the truth as you know it. You will lovingly share the truth with them. They can agree or disagree, but we still need to love them, not their beliefs.